My great plan of blogging my Vietnam trip crashed with the intermittent internet and the exhaustion of engaging in work in lets face it (although I love humidity and the heat) less than helpful environment. It all happened excessively fast (as these things do). I found it a weird cross reference of Solmons climate to New Zealand beauty. It is still too early to put any photos up that I took in central Vietnam (the work related ones), which is where I invested most effort on the photographic front. Unfortunately my touristy days were a consumed with heavy rain and err… present shopping. I didn’t return with 32gig of just work photos though, although my favourites are most definitely some of the ones I took in the Villages. 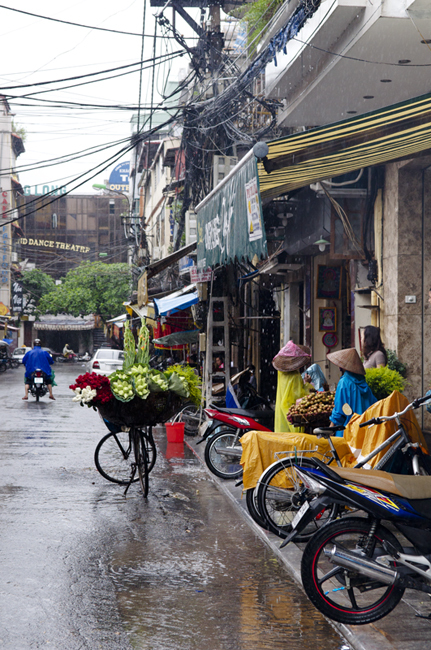 Here is Hanoi in the rain.